Opened in 2011, our luxurious self-catering cottage in the picturesque South Uist village of Lochcarnan provides nature lovers with peace and tranquility. Surrounded by moorlands and beautiful Lochs which allow brown trout fishing, the cottage offers breathtaking views through every window. Hikers will find excellent hillwalking opportunities on Ben Mor and Hecla in South Uist and Eaval in North Uist. 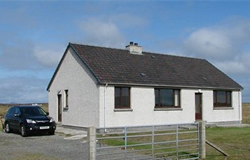 While situated in an unspoilt, quiet area, this modern three double bedroom accomodation is an ideal base from which to explore the delights of the islands of Berneray, North Uist, Benbecula, South Uist and Eriskay. A lavish garden gives children ample space for safe playing.